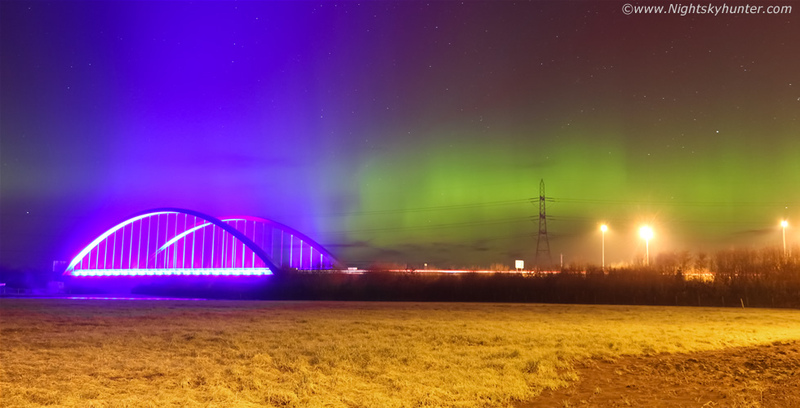 Spectacular G2 geomagnetic storm over Toomebridge captured on Mother's Day March 6th 2016 during a strong aurora with green and red rays extending 60 degrees high. It was amazing to watch dancing pillars of light moving across the sky over the lights adjacent to the carriageway and behind the bridge itself with the pillars penetrating through the blue lights of the bridge which made for an awesome and unique visual experience, read the report for more information. *All images are available for sale in the form of photo prints, canvas or digital files for licensing, if you are interested in a purchase simply drop me an email.